Is your home ready for vacation? Can you smell it in the air? That’s the smell of summer vacation! If you are planning to pack your bags soon and head off to the airport or grandma’s house, it’s important to make sure that your home is ready for your absence. Unfortunately, water damage is still the leading cause of homeowners’ insurance claims in the United States. 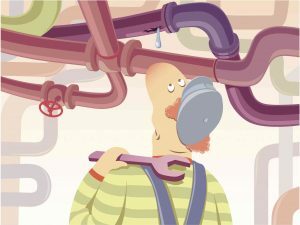 The majority of that damage is often caused as a result of plumbing failures that occurred while families were on vacation. Here are some simple steps to prepare your plumbing for a summer vacation. Any leaks should be taken care of before you take your trip! You should already be flushing your water heater once or twice a year. If you can’t remember the last time you flushed it, it’s a great idea to flush it before you leave for summer vacation. To have all of your routine plumbing maintenance completed before you leave, give Master Plumbing a call for quick service and repairs that you can trust. There are few things worse than coming home to a stinky kitchen thanks to the food that you left behind. Throw away any food that is going to expire while you will be on vacation. Make sure that your refrigerator only has what must be refrigerated inside of it in the event of power loss while you are gone. To prevent any leaking, turn off the automatic ice maker inside of your refrigerator or freezer. Summer is prime time for storms in the Maryland area, and flash flooding can mean basement flooding if your sump pump isn’t working properly. Test if your sump pump is working before you pack the care for vacation. Pour a gallon of water into the base of your sump pump. If the pump is working properly, it will turn on for a few seconds to get rid of the water and turn off. If the sump pump doesn’t respond, have repairs or a replacement taken care of right away. This entry was posted on Friday, July 21st, 2017 at 3:37 pm. Both comments and pings are currently closed.